Meson Sabika - Tapas in Grand Style! Enjoy a taste of Spain in this unique restaurant, both rich in history and flavors. 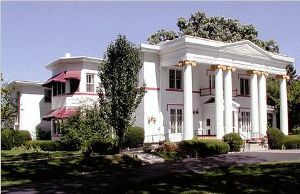 Meson Sabika is located in the magnificently renovated Willoway Mansion, built in 1847. The restaurant sits on four acres of beautiful landscape, featuring majestic 150-year-old oak trees and a charming terrace for outdoor dining in Naperville’s warmer months. The cuisine is wonderful and diverse, offering a delicious variety of cold and hot tapas, soups, salads, and paella. White and red sangria is available by the glass or pitcher and pairs well with almost any item on the menu. We love to order a pitcher of red sangria and several tapas each and share with everyone at the table! Who would imagine that a small plate set atop a glass of wine would spark an international trend? Serving tapas, (plural of tapa, meaning, “cover”) are a custom that originated 200 years ago in Spain. Clever tavern owners served savory food on the small plates to entice their patrons to consume more alcohol. Reservations are a must! On our first visit, the hostess informed us that the dining room was full for the evening. We tried to find a seat at the bar, but unfortunately they were all taken! We hope you have a lovely time!